Something has softened some of Alvin's rowdier edges, and there might be those who miss that particular spark. But, as Dave Alvin and the Guilty Women proves, the stuff Alvin's packing now can be just as powerful. In addition to his prodigious skills as a songwriter, arranger, and guitarist, Alvin has a knack for picking worthy associates. Lee Allen, John Doe, David Hidalgo, Greg Leisz -- Alvin's shared the stage or studio with all of them. It's no surprise, then, that one of the highlights of his new release is the company Alvin's keeping. Released in combination with a tribute album honoring his late friend/band-mate Chris Gaffney, Dave Alvin and the Guilty Women is, in some sense, another kind of tribute to Gaffney. Rather than continue with the Guilty Men without Gaffney, Alvin recruited the venerable Dobro and steel guitar player Cindy Cashdollar and a group of mostly Austin-based musicians -- females, the group's name would have us recognize -- which includes Nina Gerber, Laurie Lewis, Christy McWilson, Sarah Brown, Amy Farris, and Lisa Pankratz. The sound here isn't a radical departure from Alvin's recent work; he still works within broad templates of Americanisms: folk ballads, rock 'n' roll, jump blues. Frequently, the music alternates between up-tempo shuffles and somber ballads, with songs nicely rounded by the backing vocals of his band-mates and filled with sweetened fiddle lines and liquid guitar figures propped up by delicate brush and snare percussion. This is also a deeply collaborative event. Although Alvin had a hand in writing half of the album's twelve songs, his voice never dominates. One of the album's obvious highlights, for instance, is "Potter's Field", a sure-footed folk hymn written and sung by Guilty Woman Christy McWilson. Yet even as Alvin cedes center stage, his own writing is shot through with autobiography, as when describing his mother dropping him off at a Jimi Hendrix concert on "Nana and Jimi". Or as when he opens the album by revising the Blaster's signature "Marie, Marie" as a hard-charging zydeco number. Similarly, as any Blasters fan knows, the paean to Big Joe Turner, "Boss of the Blues", is no exercise in nostalgic namedropping -- Alvin and his early band actually studied at the feet of Turner during the late '70s/early '80s -- and, following up an album of covers (2006's West of the West), it's almost startling to hear Alvin explore his personal history with such candor. Even when he's testing out the musical styles of other regions, Alvin always seems to draw a line back to his own terrain. Like Faulkner, Alvin is most interested in exploring his own little postage stamp of native soil. Sometimes he's explicit about it (on albums like 1994's King of California) and sometimes more subtle, but it's clear that one of Alvin's major projects is to uncover multiple Californias. He digs around in the alleys behind the strip malls, and shines a light on spots like Los Angeles' Central Avenue, the site of a major jazz revival in the 1970s. This is the frontier California populated by Merle Haggard, Wynn Stewart, Buck Owens, Eddie Cochran, T-Bone Walker, and Hank Cochran. At first glance, the album's closer, a spirited cover of "Que Sera, Sera", feels a bit lighthearted but as the capstone to a project with such obviously emotional resonance, it adopts all the existential toughness of the deepest blues. 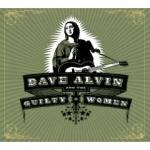 For such a nominally simple record, Dave Alvin and the Guilty Women is a compelling tapestry of voices, textures, and tones, particularly in the interplay between Alvin's highly-distilled, barrel-deep baritone and Cashdollar's soulful precision. Age, maybe, or perspective or experience -- something has softened some of Alvin's rowdier edges, and there might be those who miss that particular spark. But, as Dave Alvin and the Guilty Women proves, the stuff Alvin's packing now can be just as powerful.